□Ministry of education and Korea Industrial Technology Association awarded “Engineer of this month, December 2010” to Mr. Sung-Sun You (Samsung Heavy Industries, Chief researcher) who developed world best towing tank test system and analyzing method of model test and Mr. Jin-Lim Choi (Lead engineer, Dong-a Flexible Metal Tubes Co., Ltd) who developed the manufacturing method of world best stainless steel corrugated tubes. □Mr. Sung-Sun You who concentrated his efforts on improving the functions of ships and offshore constructions as a chief researcher of Samsung Heavy Industries Co., Ltd, was awarded “Engineer of this month, December 2010” because he developed world best towing tank test system and analyzing method of model test. □Mr. Sung-Sun You developed the world-class new concept of ship performance evaluation metering and control system, test, and analyzing method included high precision metering and control system. So it could reduce significantly the development time and cost relating ships. ○ In particular, the developed ship performance evaluation test system is applied to develop new ships and offshore construction such as floating offshore facilities like drillship and floating production storage and offloading and large containers and LNG vessels. This fact was considered that it contributed to develop the high quality products. ○Mr. Sung-Sun You is doing his best to develop highly efficient and high value-added eco-friendly ships based on fluid mechanical performance analysis technique development competitiveness relating ships and offshore construction which is distinguished globally. 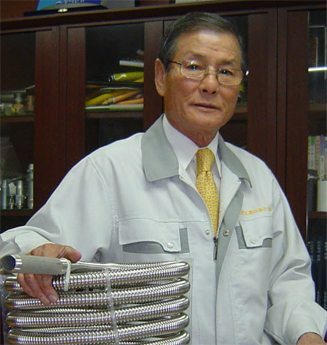 □ Mr. Jin-Lim Choi, who developed stainless steel corrugated tubes for 28 years only as a lead engineer of Dong-a Flexible Metal Tubes Co., Ltd, was awarded “Engineer of this month, December 2010″ because he world first developed welding technique, forming technique, and fittings for helical corrugated tubes. 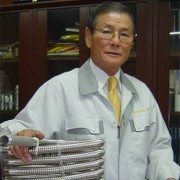 □ Mr. Jin-Lim Choi improved the manufacturing process of stainless steel flexible tube which was developed in advanced countries as a higher value-added product with his own technical skills and succeeded in exporting the world best stainless steel corrugated tube to advanced industrial countries. ○The amount of export was 8.3 million dollars in 2008, 9 million dollars in 2010, and 10 million dollars in 2010 and this fact was considered that it contributed to realize the vision of global leading products and enhance the competitiveness of related industry. ○ Even though Mr. Jin-Lim Choi is very old, he is acting as a technical consultant of FM (Factory Mutual) which is one of American quality certification organizations and is concentrating his efforts on new technical skills which can apply to various stainless steel products. □ Dong-a Flexible Metal Tubes Co., Ltd which was established in 1982 is manufacturing stainless steel corrugated tubes (annular type & helical type) only and providing them all over the world. They obtained UK original ISO9001-2000 quality management system and other foreign quality certifications. So this company is a promising company which is growing and pushing into American, Japanese market and European market such as Germany, UK, and France. 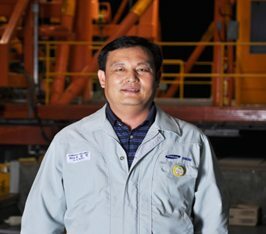 □”Engineer of this month” has been given since July in 2002 in order to raise the pride of engineers and treat them with preference by finding the excellent engineers and awarding them who contribute to international competitiveness and industrial development through technical innovation at industrial sites. This award is given to an engineer from a conglomerate and a middle-sized company with Ministry of education’s awards, a trophy and a prize of 10 million won every month.